Esplanade East is a district of San Fierro, San Andreas, and rests on the northern section of San Fierro's eastern coastline. It sits atop an engineered seawall on reclaimed land. To the north is Esplanade North and to the south is Easter Basin. 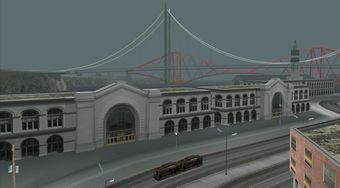 To the west is Downtown San Fierro. The road separating Esplanade East from Downtown is meant to emulate San Francisco's Embarcadero, with its renovated boulevard and pedestrian malls. This is an area frequented by tourists and locals alike. Correspondingly, Esplanade East is a mix of city dwellers and visitors, many of which are enjoying a stroll along the waterfront. This gives the area a relaxed feel and a gentle atmosphere. The Garver Bridge looms overhead, and the cable car line runs along the Esplanade, making for some dramatic city photographs. A re-creation of San Francisco's Ferry Building, with its famous clock tower, also sits in Esplanade East. This page was last modified on 27 July 2012, at 14:54.